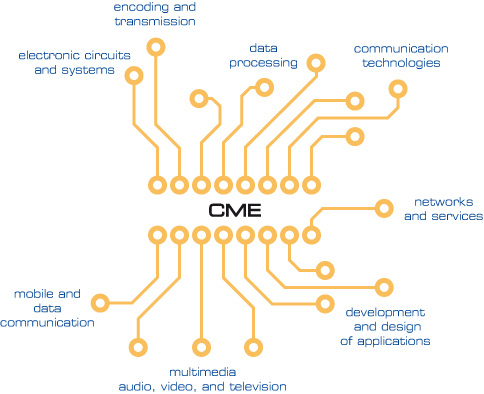 Thank you for your interest in CME program. Please note that since the academic year 2017/2018 this study program will be replaced by a newly accredited one – Electronics and Communications (see http://ek.fel.cvut.cz/en/about/). Therefore no new students can apply for the CME program. The study program in Communication, Multimedia and Electronics supports the graduates in their application and needful uniformity versatility at the labor market; it offers a wide theoretical and used-oriented basis and the specialization in one of the four branches containing the problems of communication (transmission of information), multimedia (the mergence of audiovisual and computational technology), and electronics (the construction of related arrangements). The bachelor and the master study program in Communication, Multimedia and Electronics covers vast area of modern electronic technologies of information processing with a view to both: hardware and software. This branch has to do with the data transmission (communication), interaction with human subject and physical reality (multimedia), and the construction of corresponding appliances (electronics). The study of this integrated program brings the graduates the advantage and versatility at the labor market with the regard to the synergic incidence of its particular parts.